Despite this just being a mini-campsite, we did have some neighbours last night. There’s a group of Austrian cyclists in a motorhome, a German couple with their baby in a camper van and a young Dutch couple in a converted old Mercedes van. We spent some time talking to the Dutchies. They have only just set off on a long trip around Europe with no real fixed plan. We can’t imagine a better way to travel! Breakfast this morning is relaxed. We make ourselves a big portion of hot porridge with dried fruits, nuts and the honey we bought in Montenegro. Investing some time in a nice big breakfast pays off later in the day. At lunchtime you can get away with a limited and very light lunch. 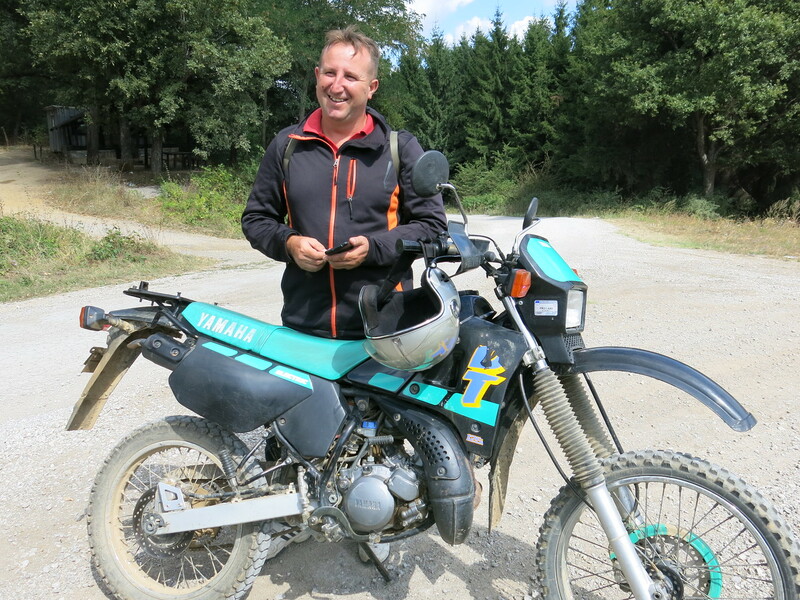 More time for riding and exploring and less stuff to carry in our tank bags. 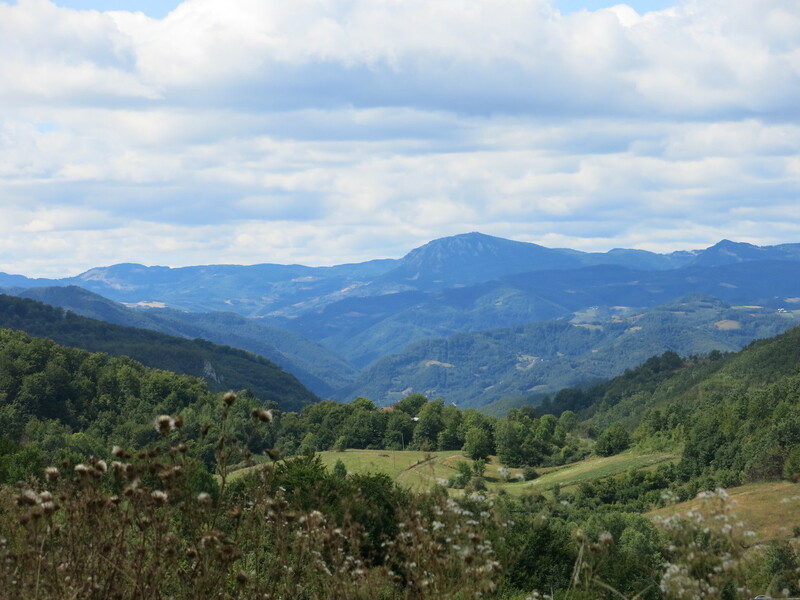 From here we’ll ride south through the mountains towards the border with Kosovo. Crossing the border isn’t in the plan this time. 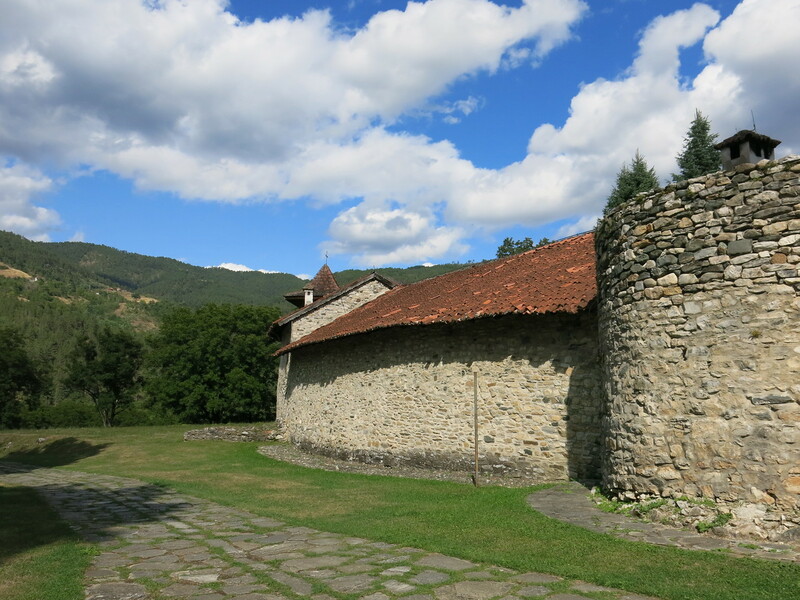 We’ve been to Kosovo before and didn’t find it all that interesting. Besides, our bike insurance explicitly excludes Kosovo. So we would need to buy insurance at the border, which costs 25EUR per vehicle last time we visited. Not an expense we’re willing to make on this occasion. 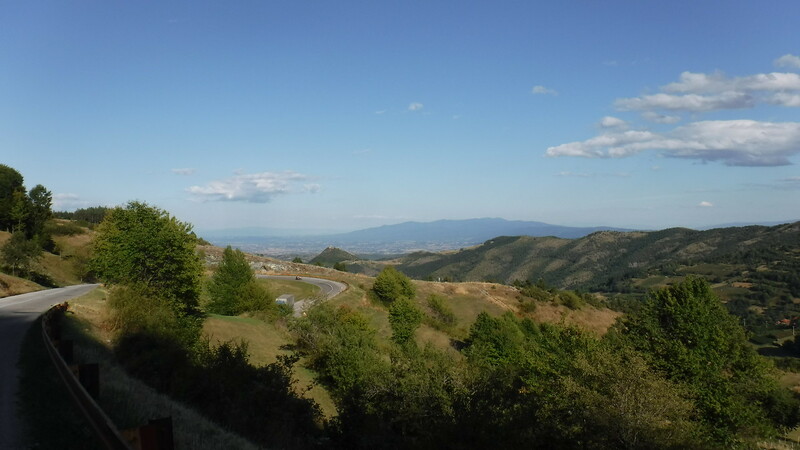 The landscape in this area is pretty interesting though and we do enjoy the riding. 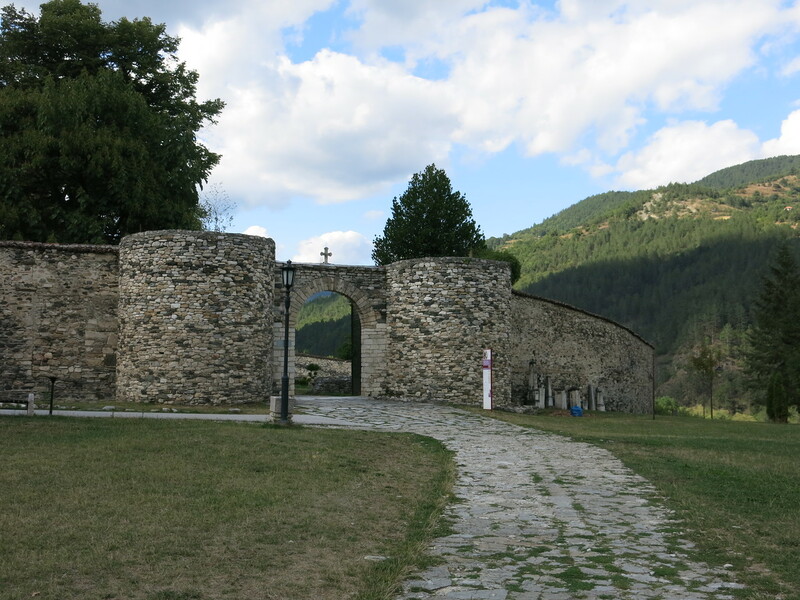 It’s early afternoon when we spot a sign to the Studenica Monastery and decide to check it out. It is an enjoyably twisty ride so we don’t mind the monastery turns out to be a bit further off than we thought. From the outside it looks like it has been beautifully restored. The defensive wall and the church tower visible behind it are in perfect condition. Inside the restoration has been carried through to pretty much all of the buildings. 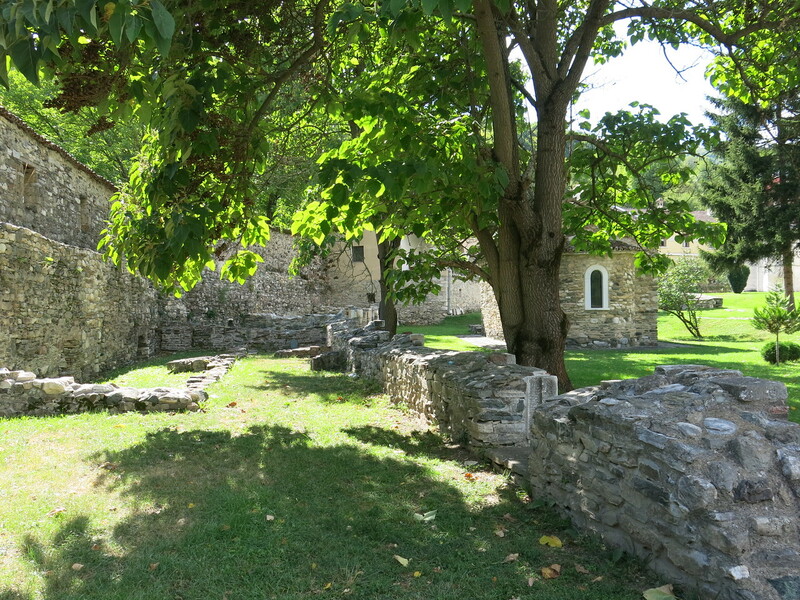 Except for a few ruins of smaller dwellings. 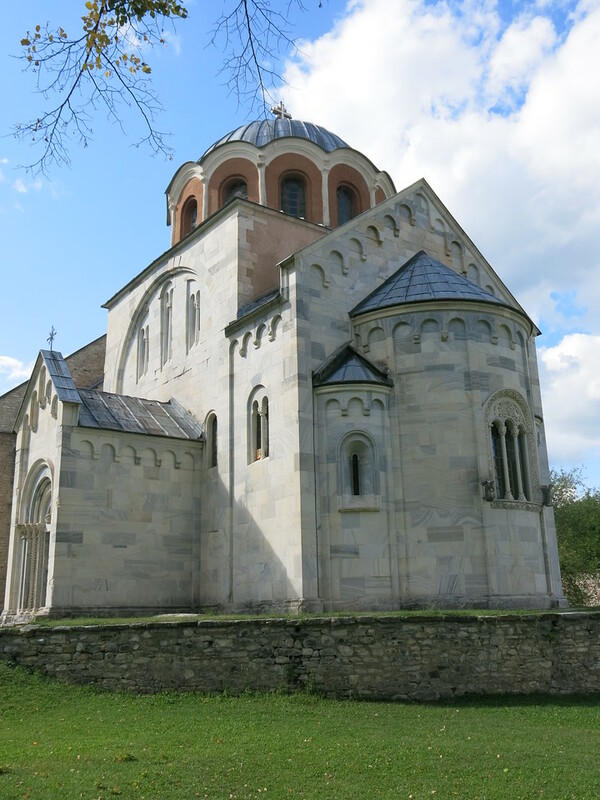 The Studenica Monastery has played an important role in the Serbian orthodox church, so it shouldn’t be surprising some serious money is being invested into preserving its glory. 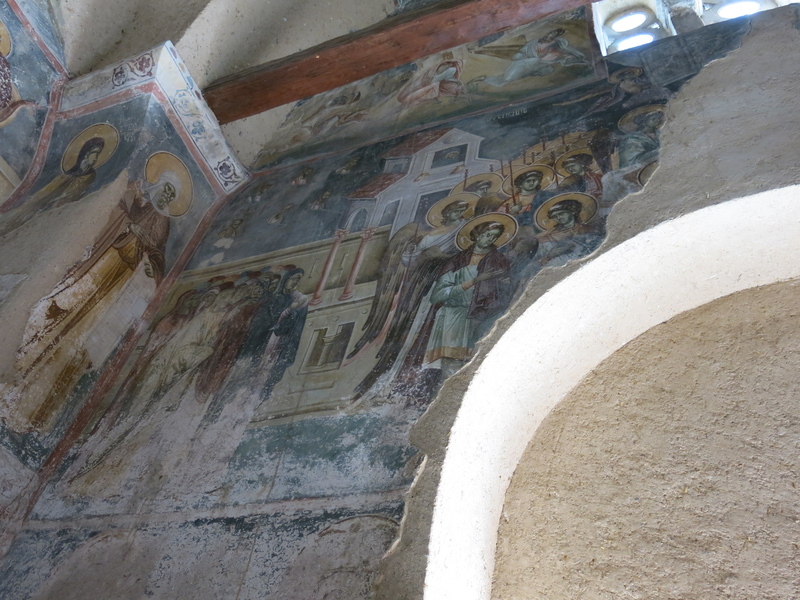 In the past the Monastery suffered serious damage from the Turks looting and vandalising the place. 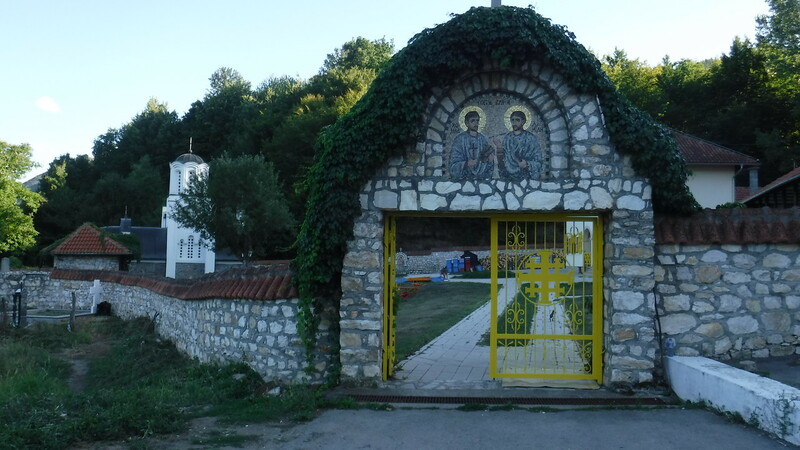 Most damage was suffered during the Serbian rebellion against the Ottoman empire. But the Serbs themselves aren’t entirely without blame either. We learn from one of the monks that an ill-advised restoration attempt in the 19th century caused more damage than it actually helped. 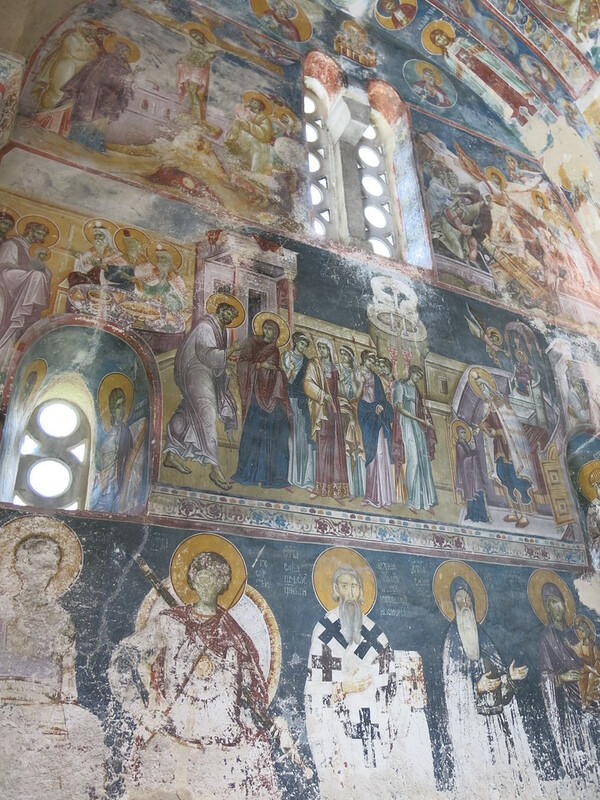 The church inside the monastery is renowned for its beautiful frescoes in byzantine style, many of which have only recently been exposed again after they were covered during the 19th century “restoration”. A team of young archaeologists and painters are now meticulously exposing and touching up the ancient glamour. It is a work that will take many more years to complete. But looking at the areas which have already been done, it is well worth the effort. The entire place oozes a pleasant tranquillity. We’re definitely not the only ones to have noticed. An elderly Dutch couple in a camper van have received permission from the abbot to spend the night in their camper on the monastery grounds in exchange for buying their evening meal from the monks. 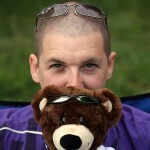 We also consider staying there briefly, but it is a bit early in the day for us to be pitching our tent. So we say our goodbyes and continue our ride. After a couple more hours of going up and down the twisty hillside roads we’ve gradually reached the point where looking for a place to sleep is on the table. But like it sometimes goes on these trips we can’t seem to find an interesting option. The surroundings don’t really lend themselves for wild camping and we’d prefer not having to take a room in a hotel. 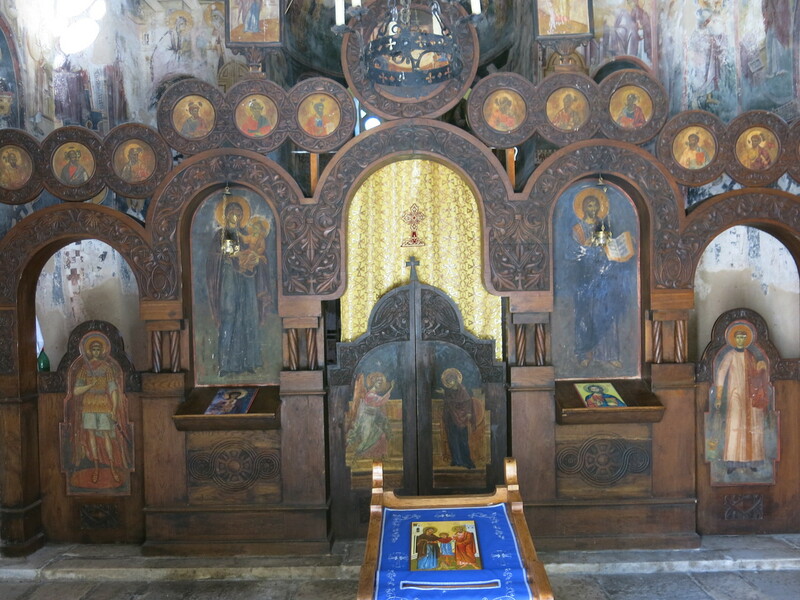 Inspired by the Dutch couple we decide to try our luck in a small much more recent monastery. When we arrive it turns out only a single monk is living there and he’s very busy sprucing the place up by painting the windows and window covers in bright colourful motives. He’s not very keen to let us put up our tent, but we’re welcome to visit the chapel. He also offers to make us some coffee or grab us a beer. Sofie isn’t too keen as she’d prefer to look further for a place to sleep. In hindsight taking the guy up on his offer would probably have resulted in him letting us spend the night. But today doesn’t seem to be the day we make our best decisions. 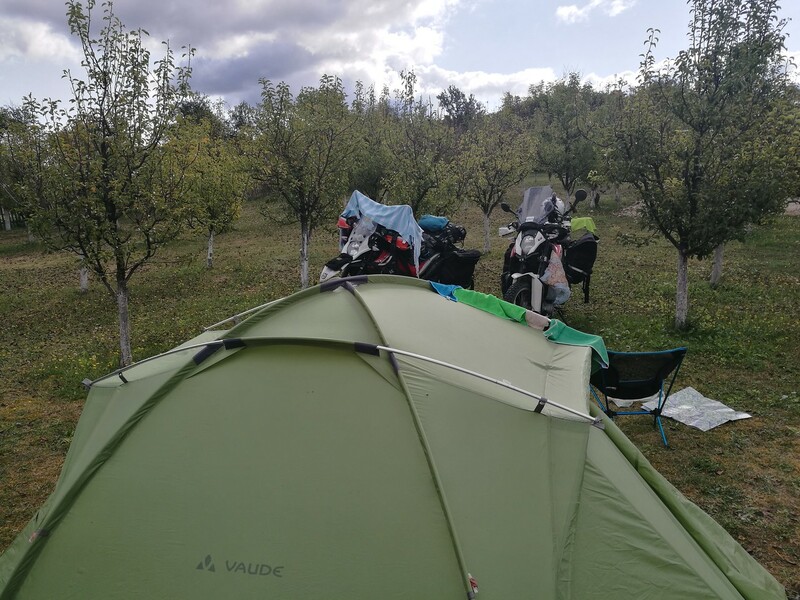 In the end we give up on finding a nice place to pitch our tent and ride to Vrnjačka Banja in search of a room. Maps.me shows us some options and we pick a cheap room with private parking in the center. At least we can walk down the street to a restaurant which offers traditional local meals and seems to be quite popular with the locals as well. And the private parking is as good a place as any to do a bit of chain maintenance and tensioning. In the morning I grab some delicious looking pastries from the bakery around the corner. Their chocolate covered croissants are huge and a bit messy to eat, but just as tasty as they look. 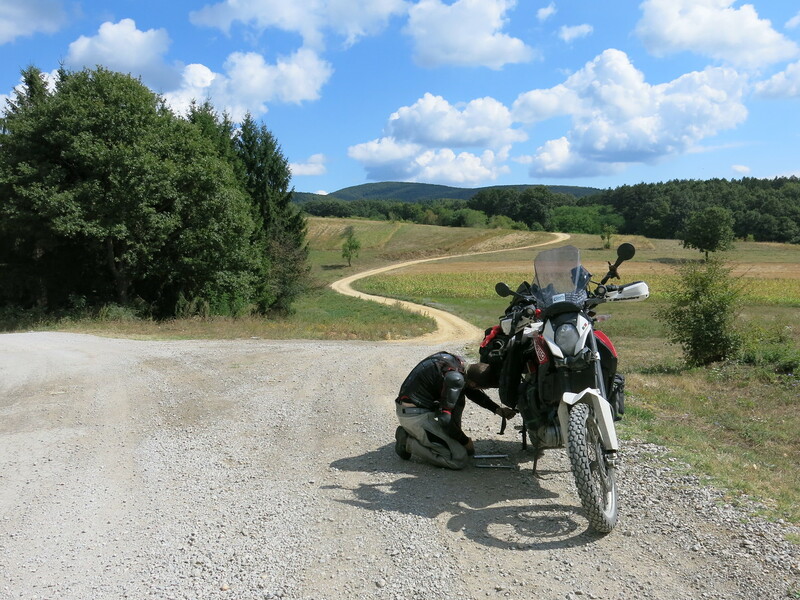 It’s a pretty nice day again and soon enough we’re back enjoying the ride on gravel roads making our way Southeast along the Kosovo border. Suddenly though a worrying thought hits me. Did I forget to use the lock nuts on the chain tensioning bolts last night? For the life of me I can’t remember taking that rather crucial step. Better stop to check it out. Sure enough I seem to have been a bit distracted while doing the work last night. I break out the tools and start over with the rear axle alignment work. Meanwhile a local on an old little Yamaha stops for a chat. He introduces himself as Ljubishi and he turns out to be a local forest ranger. We talk motorbikes a bit and like other people we’ve crossed the past 2 days he also wants to know whether we entered from Kosovo. The political situation of the region is still very much on people’s minds over here. When I’m done with my work we say goodbye and he blasts off into the forest on his little motorbike. There are no particular points of interest that draw our attention today. So until we stop for lunch we’ve just been riding and making good progress. A small area with picknick tables and a spring offers the perfect opportunity to munch on the meat and cheese pastries from the bakery in Vrnjačka Banja. We’re not even deterred by the three local cops who are already enjoying their lunch break at the same place. After the boys in blue leave we’re approached by a farmer living in a small house down the road. He’s joined by a gypsy couple. It’s a bit hard to make out what they are trying to tell us, but it seems we’ve picked a rather special place to have our lunch. They keep pointing at the tree and the plaque next to the spring. 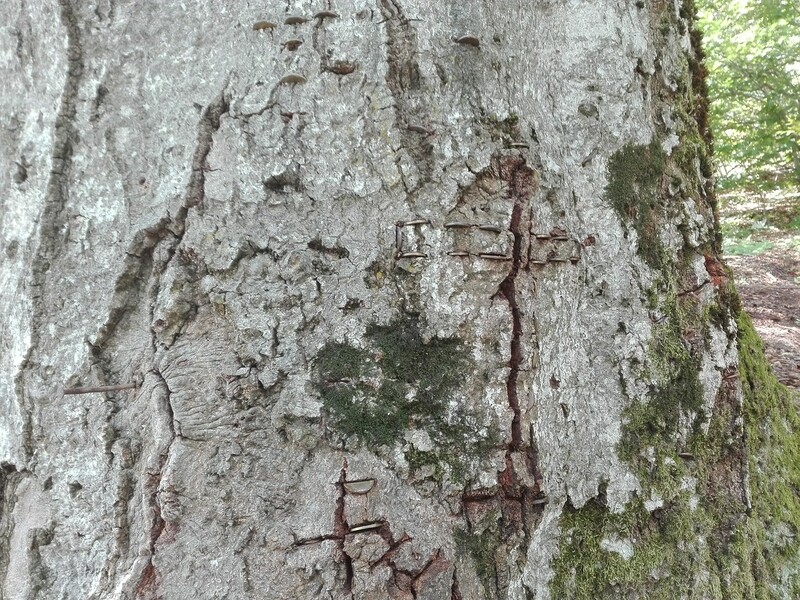 We end up understanding that a saint, possibly Mary, appeared on the tree. Since then the water from the spring presumably has healing powers. 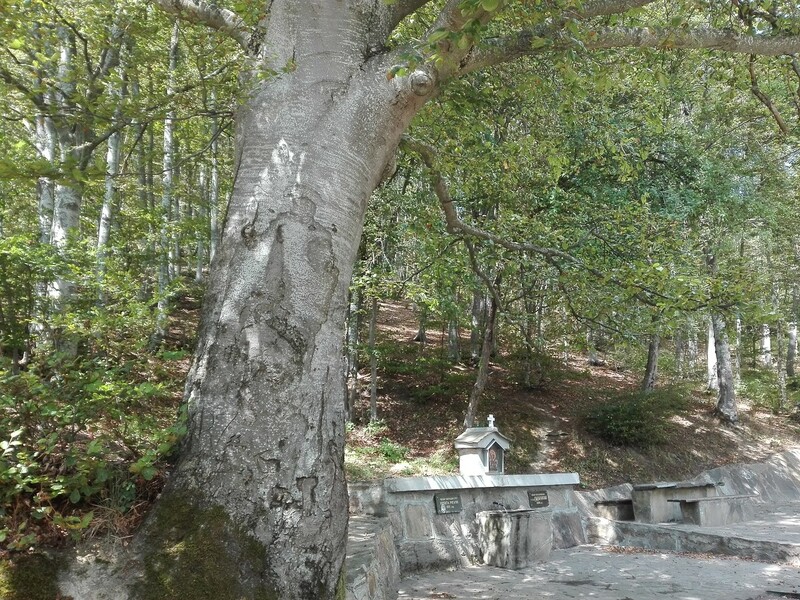 Locals have been shoving coins into the tree in the hopes of receiving protection from disease. The numerous plaques around the site are a testament that in some cases it actually seem to have worked. Keen and curious adventurer who feels just as much at home in IT as in the workshop tinkering on bikes. Loves exploring the world, its people and himself, preferably on 2 wheels behind the handlebars of his beloved bike. Lucky to have found a partner in life and on the road to share this with.